Since completion in 1914, the Panama canal has been vital for maritime trade between the Atlantic and Pacific oceans by cutting through the Isthmus of Panama to eliminate the lengthy and dangerous Cap Horn route looping around the southern tip of South America. As far back as 1825, the newly established Federal Republic of Central America had considered building such a canal, and even began surveying possible routes. 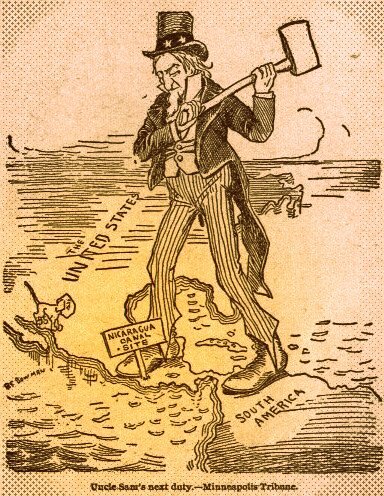 1895 political cartoon advocating US action to build a Nicaragua Canal. While the US government declined involvement due to concerns about political unrest, American industrialist and philanthropist Cornelius Vanderbilt was granted exclusive rights to build such a canal in 1849. Unfortunately, the concerns of the US government proved prescient, and a civil war in Nicaragua ended the project which had already begun via stagecoach and train. This delay would prove costly for Nicaragua, as the discovery of gold in California that same year fueled the creation of the Panama canal while Nicaragua’s rival project languished. The Panama Railway was completed in 1855, and construction began by the French in 1881 to build a sea-level canal. Ultimately, the project was abandoned by the French due to disease, and the sheer difficulty and enormity of the project, opening the way for the US Senate to back the construction of the canal in 1902. A route through Nicaragua would shorten trips from New York to San Francisco by nearly 500 miles, but the project was largely forgotten after the completion of the Panama canal aside from various studies and surveys mostly by the US government. In 2004, the government of Nicaragua renewed interest in the potential for the project, including capacity for so called post-Panamax ships giving the canal an edge over Panama’s more narrow canal. Unfortunately, the costs for such a project have been estimated at 25 times Nicaragua’s current annual budget at approximately $18 billion USD, and would take 12 years go complete. At the same time, it has been estimated that the canal could double the country’s current GDP of $7000 million USD. Current Nicaraguan President Daniel Ortega, has drawn interest in the project from left leaning nations such as Russia, and especially Hugo Chavez of Venezuela who has been vocal of his radical views of the west, and has gone as far as forming partnerships with the antisemitic regime in Iran. Chevez has expressed particular interest in a canal which would facilitate the movement of Venezuelan oil across Nicaragua to markets in Asia, and on June 5, Ortega presented “The Project for the Grand Canal of Nicaragua” to his National Assembly.